Brisbane's second purpose-built jail was constructed by contractors Andrew and John Petrie in 1860, on a site known then as Green Hills, and known today as Petrie Terrace. The jail was designed by Charles Tiffin, then New South Wales Clerk of Works, and cost £25,000 to build. It consisted of two two-storey cell blocks, as well as guard houses, storerooms, laundry and kitchen facilities, lavatories and washrooms. In 1883, a new jail was built at Boggo Rd and prisoners were transferred there, so the buildings were converted to use as a police barracks. 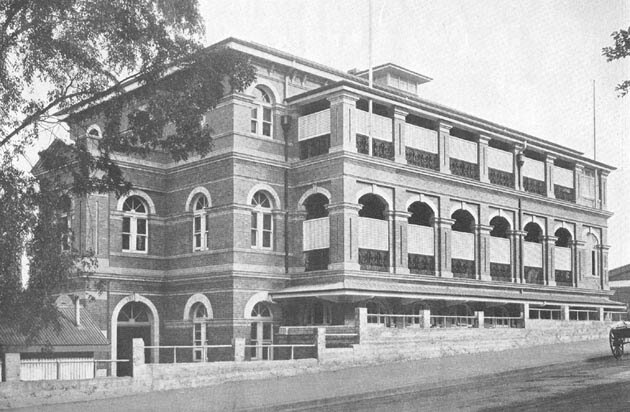 Around 1885, the military barracks next door was renamed Victoria Barracks, and the whole Petrie Terrace complex was split between the defence force and the police force. 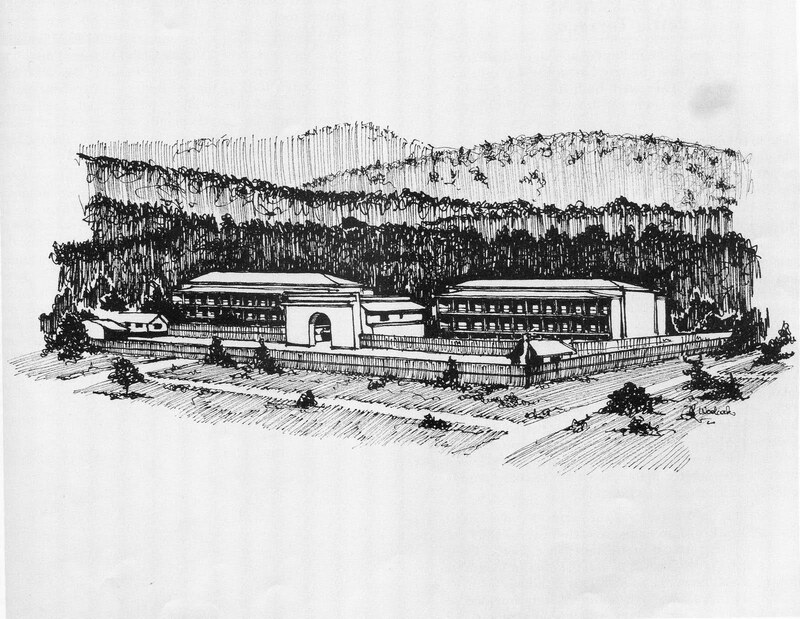 Over ensuing decades, the shortcomings of the building for the purposes of accommodating and training police became apparent, and at the end of the 1930s it was decided to construct a new purpose-built police barracks and training facility. 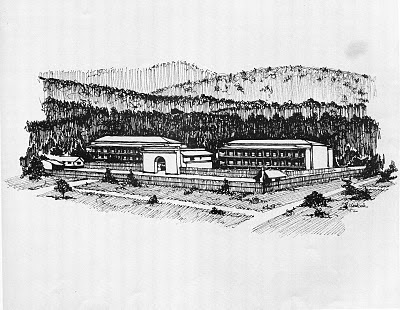 Architect RC Nowland of the Public Works department designed a three-storey brick and cement complex that would provide accommodation, offices, training facilities and recreational areas for police. The building was opened on 29 September 1939, and here is a photograph of it from 1951. Nowland's red brick building was perched on the ridge above Roma St, and its distinctive appearance and size made it easily recognised over much of Brisbane. During WWII, the barracks were also used by various Australian and US military personnel. 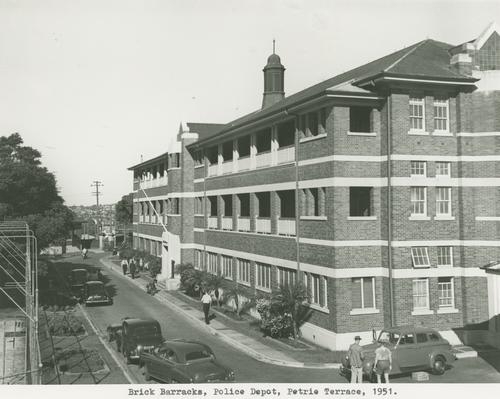 After the war, police continued to be housed and trained here until the opening of the new police headquarters at North Quay in the early 60s and the creation of the Oxley Police Academy in 1973. In the late 80s, the buildings in the complex were sold, and the former stables became a nightclub (the famous Underground! ), while the former wireless transmission building became a restaurant. The rest of the site fell into disrepair for many years. In 2008, the complex was redeveloped as The Barracks, a shopping and restaurant precinct, and a current picture of the main building can be seen above. I am assuming a lot of Brisbane's early population were the convicts of the Moreton Bay Penal Station which must have been closed well before Green Hills Gaol was built. So what happened to the convicts - were they freed? held elsewhere? That is actually a very good question. The Moreton Bay penal settlement was closed around 1840, and most of the convicts were returned to Sydney. Brisbane continued as a "free" settlement, and so the prisoners being sent to the jail were people convicted here. My Great Grandfather,Fredrick Waters was renting a portion of the old gaol as late as 1899 when there was a rather large fire that commenced in the back of his furniture store.A total of eight buildings were burned with varying degrees of damage but Fred's house,stables and store was destroyed.It was apparently a large fire with soldiers from the Victoria Barracks assisting to put out the flames plus fire units from as far away as South Brisbane were deployed to assist.It is a well documented blaze and several accounts can be found on the TROVE Newspaper history website,Apparently it was after this that the Police actually moved to what was probably gazetted for their use some years before.Fred Waters then built the existing takeaway food building opposite the Barracks in Petrie Terrace for his furniture store.He died aged 82 in 1925 and his wife Frances died in 1942 aged 97 with over 100 descendants living in the Petrie Terrace/Upper Paddington area running her various business interests. Interesting information - thanks Anthony.